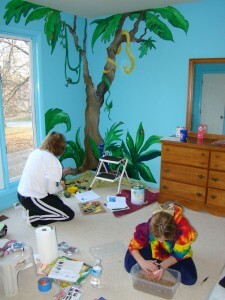 J-BEAN’S ROOM – As you might recall, my mom came down while Steve was out of town this past October and got things rolling by painting our walls a medium shade of blue (NOT Carolina Blue!!!). 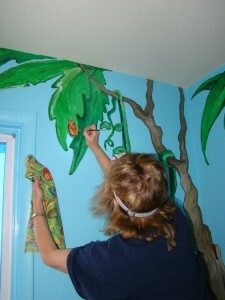 Over the past couple of weekends, my good friend and co-worker, Kim Maples, has been working hard painting some absolutely AMAZING rainforest scenery and animals on the wall. 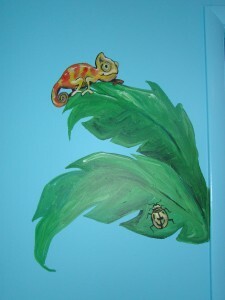 We scavenged children’s books as well as the internet to find ideas that we liked, in addition to using some of the cute little bugs that were on the fabric we chose for the crib skirt and bumpers. So, here’s what we ended up with!!! 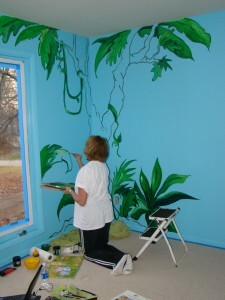 Kim filling in the vines. GLUCOSE TOLERANCE TEST AND ULTRASOUND – In other news, I had to go for my 3rd trimester glucose test this past week. For those of you that don’t know, it is a routine test that makes sure my body is processing sugar correctly and that I don’t have gestational diabetes. I was allowed to eat a light breakfast no sooner than 3 hours before the test, but was advised to keep it to protein and very low-carb. (which I guess meant my gigantic bowl of cereal and fruit was out…). I woke up early so that I could down a protein bar, but was helplessly hungry not more than an hour later. Thankfully my appointment was at 10 so I didn’t have to wait too long. I drank 10 ounces of a fruit punch flavored glucose solution (which I had heard a wide range of stories about, some of which scared me…) but surprisingly, it wasn’t that bad – I actually almost liked it! Matching bugs from the fabric swatch! View from the door - also on display is the gorgeous blanket my bro and sis in-laws got us! So we get into the ultrasound room, and of course J-Bean’s big ole head pops up immediately. The sonographer begins searching for body parts to measure, and keeps saying things like, “wow…very healthy…no growth problems here…” As it turns out, our little guys is not very little AT ALL!!! 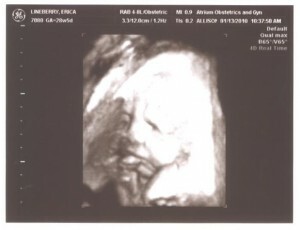 According to the measurements, he is estimated to weigh 3.8 pounds ALREADY!!!!! He is in the 81st percentile for weight…The sonographer also appreciated the irony of our coming in based on my low weight gain (although me personally would hardly call 15 pounds insignificant…) only to find out that we have a monster in there! At this point we began to get a little worried about thte logistics of labor with an 81st percentile baby and a significantly less than 81st percentile mom…but the doctor just laughed and said not to worry about it at all. He said everything looked fantastic and that our little monster looked very healthy! So J-Bean’s new nickname is “The C-Squatch,” which seemed a little more size-appropriate at this point than Jellybean…So of course the “squatch” part comes from “sasquatch”, but why the “C” you might ask? Well…..we have picked out a name!!! Drum roll please…our new arrival will be named Canaan Ray Lineberry! Canaan = the land that God promised to the Israelites in the Old Testament. However, it took them a while to be able to get to it. They had to work through a bunch of things and did a lot of wandering around before they were ready to enter it – kinda like how we wait on God’s perfect timing and did some globe wandering of our own before we felt like we were ready to expand our family. Ray = a family name…on both sides!!! Steve and I both have a grandfather and an uncle named Ray – only on my side, its actually “Raymond”, and on Steve’s side, its “Rayford.” We felt like “Ray” would be a great way to honor both sides of the family! The C-Squatch - Check out those cheeks!!! 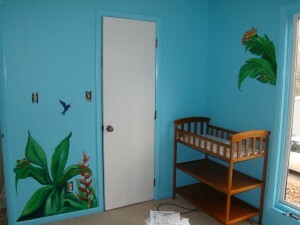 The nursery looks amazing! I love the colors, the painting and the new fun blanket goes perfectly. I’m anxious to see it in person. Hey Erica! 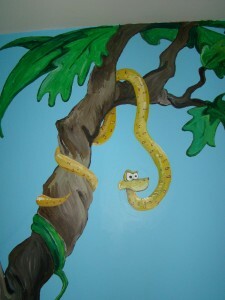 The mural is so beautiful! 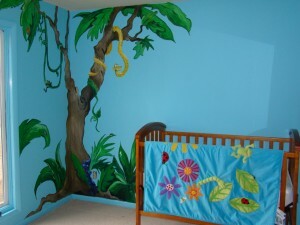 What a fun room – the little one will love to stare at the walls when he’s a few months old! As for the little one’s weight right now, don’t be too worried – our child birth instructor said that doctors can be off by as much as a pound or two when determining the weight of the fetus! But you’ll do great! Walter was 9 lbs 6 oz and I delivered him just fine (only pushed for 30 minutes). Oh, and I lost all the pregnancy weight within two weeks – it literally just fell off. So you shouldn’t have any trouble there too! Good luck to you and Steve with everything and best wishes on the most fantastic journey of your life!! GREAT post! Your friend is such a talent! I am in awe!